The Cygnus OA-9 cargo spacecraft will depart the International Space Station on July 15, 2018. A Cygnus cargo ship will separate from the International Space Station (ISS) Sunday morning (July 15), and you can watch its departure live online. The Cygnus OA-9 spacecraft, also known as the "S.S. J.R. Thompson" arrived at the ISS on May 24 with 7,385 lbs. (3,350 kilograms) of supplies and science experiments. It will leave the orbiting lab at 8:35 a.m. EDT (1235 GMT) on Sunday, kicking off a two-week journey that will end in a fiery plunge through Earth's atmosphere. NASA TV will air live coverage from the ISS beginning at 8:15 a.m. EDT (1215 GMT), and you can watch it live here on Space.com. Instead of heading straight down to Earth, the Cygnus will spend two weeks flying solo in space "to allow the Cygnus flight control team to conduct engineering tests," NASA officials said in a statement. It will also deploy several small satellites called cubesats into orbit using an external deployer built by the Houston-based company NanoRacks. But the bulk of the cargo Cygnus will take away from the ISS is garbage — "thousands of pounds" of it, NASA officials said. On July 30, the S.S. J.R. Thompson will end its mission and deorbit, falling to Earth and burning up in the atmosphere along the way. There's no need to worry about any falling debris, though. If any pieces of the spacecraft happen to survive reentry, they’ll fall safely into the Pacific Ocean, NASA officials said. Cygnus cargo vessels and the Antares rockets that launch them into space are built by Northrop Grumman Innovation Systems (formerly Orbital ATK), a private company that NASA has contracted to fly cargo to the ISS after the space shuttle program ended in 2011. NASA also contracted SpaceX to do the same with its Dragon spacecraft and Falcon 9 rocket. Because the ISS experiences a tiny amount of aerodynamic drag in Earth's upper atmosphere, it slows down over time, causing its orbit to decay, DeMauro said. The ISS already has the ability to boost itself, but visiting Cygnus vehicles can now serve as a backup for the station's own built-in thrusters. On average, the ISS orbits Earth at an altitude of 248 miles (400 km), and the Cygnus test raised it by 282 feet (86 meters). "The burn went extremely well," DeMauro said. "The spacecraft behaved exactly as we expected." 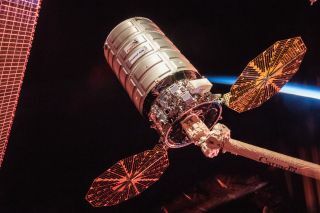 DeMauro said that Cygnus vehicles could in the future be used to lower the space station's orbit — or even to deorbit the ISS entirely, pushing it down into the atmosphere where it would burn up much like the S.S. J.R. Thompson will do on July 30.